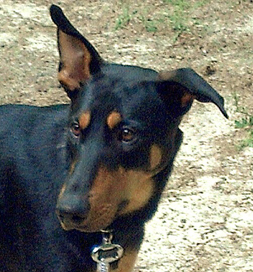 The Karkanawis of Raleigh, NC, knew what kind of dog they wanted — a Doberman Pinscher or Doberman mix — but they had a specific list of characteristics that had to be met. The dog had to be young and not too large; he or she had to get along with the couple’s two cats as well as their nephews, nieces and other family members’ dogs. Read the story in Leslie’s words. There was only one problem: he tested positive for heartworms, which had made finding him a forever home difficult. The Karkanawis decided to take a chance. “Two months later,” Leslie says, “he has completed his treatments and is happily adjusting to life at home with us.” The couple renamed him Argo. Everyone loves him, Leslie says, although she admits that maybe love is too strong a word for how the cats feel about their new sibling. But for Argo, it’s a heart-perfect match.